The 1972 Buick Sylark GS Coupe. The trend toward owning and operating smaller cars in the post-war economy become so pronounced that imports no longer filled the need alone. In the early 1950s several North American automakers fielded small cars but only Nash, with its Rambler, was successful in penetrating the market. Hudson, Willys and Kaiser-Frazier failed miserably with its small cars. Independent Studebaker did very well with its 1959 entry of the Lark. The 1960 Chevrolet Corvair Monza. With nearly 30 percent of the domestic market being claimed by small cars, General Motors, Ford and Chrysler took note. Chevrolet introduced the rear-engined Corvair for the 1960 season. It was designed to take on Volkswagen. Ford’s Falcon and Frontenac and Chrysler’s Valiant, on the other hand, went after the market created by Rambler and Studebaker. When the Corvair did not fare well in the sales game, disappointed GM designers hurried back to the drawing board for a second stab at the small car market. This time around, a more conventional Bowtie passenger car evolved. The Chevy II bowed for the 1961 selling season. To make sure that GM did not lose a single sale, Chev's corporate sisters were given small cars of their own: the Pontiac Tempest, the Oldsmobile F-85 and the Buick Special. The 1961 Buick Special Station Wagon. The Buick version was the most luxurious of GM’s compact offerings, with standard equipment and trim levels above its kin. Small did not mean cheap, either. The Special opened at $2,952 with tax—and that was for a completely stripped model. 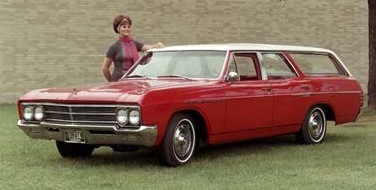 The Deluxe station wagon listed for $3,462.00 before any optional equipment was added to the price tag. A total of 1,091 units were sold throughout the Dominion during the calendar year. Sales dropped to 885 for calendar year 1962, even though it could be ordered with the newly minted Fireball V-6 engine. Sales rebounded to 1,497 units for 1963. A new, larger body style was bestowed upon the Buick Special and the Skylark for the 1964 selling season. 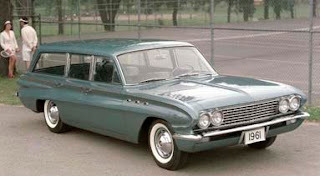 The smallest Buick now rode a 2 921-millimetre (115-inch) wheelbase and was now classed as an intermediate-sized car. Sales mushroomed to 5,448 units in 1964 and inched upwards to 5,901 units delivered in 1965. General Motors opened a new factory in September of 1965 in St. Therese, Quebec, a suburb north of Montreal. The plant turned out Buick Specials. Substantially revamped look prompted sales to rise to 7,646 units in 1966 but the finish was only good enough for 31st place—a drop of four notches on the nameplate sales chart. Climbing back up to 29th place in 1967, Buick Special garnered 8,343 sales. 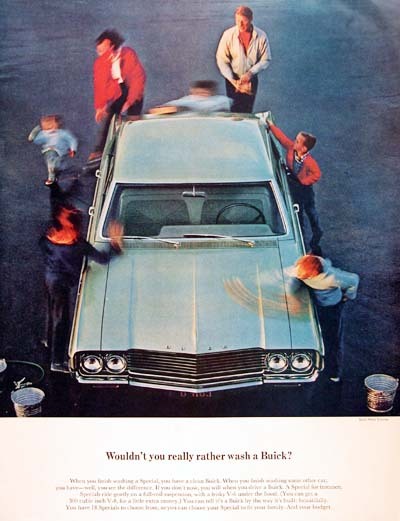 GM Canada began to take advantage of AutoPact, the international trade agreement that came into effect in 1965, and shipped 6,523 Buicks to the USA in 1967. Revamped again and given a much heavier look for 1968, Buick Special was dropped and the Skylark rose to the 20th spot with 12,862 units sold. Special was returned and along with Skylark racked up 13,851 sales in 1969 and inched up to 19th place. No doubt the tag line, “Wouldn’t you really rather have a Buick?” helped increase sales. The 1970 season saw Special retired—again---and the Skylark tally was 10,111 units, enough for 21st place. A total of 13,444 sales in 1971 earned Buick’s Skylark 22nd place. 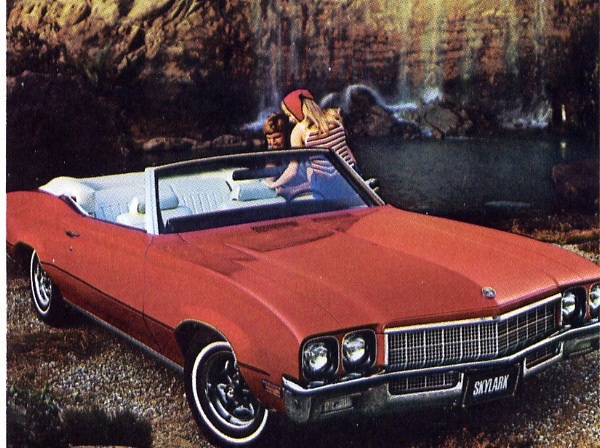 The 1972 Skylark two-door coupe was the least expensive Buick model. It carried a list price of $3,366. When the 1972 models bowed, it was the third year for the body style. The car was pitched to young couples with such lines as “you take your wife to a quaint little restaurant” and “It’s your first new car together.” Skylark was also pitched to young black executives, “Skylark goes well with your first great job.” The car came in four trim levels—base, the 350, the Custom and GS. No Buicks were built in Canada that year. The station wagon was treated separately from the sedans. It was given a standard dual-action tailgate. The GS designation was given to the high-performance convertible and Sport Coupe. These models were trimmed with all the best that Buick had to offer. Goodies included dual exhaust, functional hood scoops, side terminal energizer, heavy duty springs, shock absorbers and a stabilizer bar. Even the sunroof was standard equipment. These posh speedsters carried the 5.7-litre (350-cubic inch) mill but could be upgraded to the 7.5-litre (455-cubic inch) monster, generating 225 horsepower. With a price tag of $3,917, the 1972 Buick Skylark Custom four-door hardtop weighed 1 691 kilos (3,729 pounds). The Custom boasted its own grille and came as a four-door hardtop, a four-door sedan, a two-door hardtop and a convertible. The doors operated the interior light; it got front and rear ash trays, a deluxe steering wheel and carpeting fore and aft. Under the hood was the 150-horsepower V-8 engine, mated to the three-speed manual transmission. The automatic shifter was an extra cost item. The four-door sedan wore Roulet-grain Expanded Vinyl and Madrid-grain Vinyl upholstery. 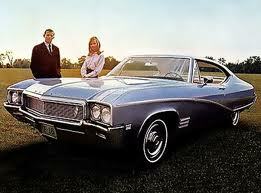 The 1972 Buick Skylark 350 four-door Sedan weighed in at 1 630 kilos (3,595 pounds). The Skylark 350 was more modestly trimmed and carried special “350” plaques. It could be had as a four-door sedan or a Sport Coupe. Interiors were upholstered in Kalmara cloth and vinyl and the floor was carpeted. The all-vinyl “notchback” seat with centre armrest was optional on the 1972 Buick Skylark. The base Skylark was offered as a four-door sedan, a Sport Coupe and a two-door pillared coupe. It came with heater and defroster. Its cabin was dressed in modest Kasmar Cloth with Madrid-grain Vinyl. It could also be dressed in all Madrid-grain Vinyl. Magic Mirror colours for the Skylark were Arctic White, Crystal Blue, Hunger Green, Sandalwood, Antique Gold, Silver Mist, Seamist Green, Fire Red and Cascade Blue. The Sportwagon and GS could also be seen in Stratomist Blue, Heritage Green, Burnished Copper, Cortez gold, Sunburst Yellow or Flame Orange. For extra cash a Skylark could also wear Regal Black, Royal Blue, Sierra Tan, Nutmeg, Champagne Gold, Charcoal Mist, Emerald Mist, Deep Chestnut, Burnished Bronze and Vintage Red. 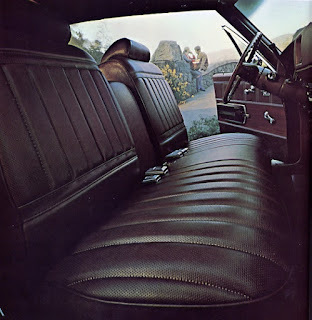 The instrument panel of the 1972 Buick Skylark carried all the luxurious cues of its larger, more expensive brothers. Optional equipment included an AM/FM stereo radio and tape player, a centre console, power seats, Climate Control air conditioning, Soft-ray tinted glass, rear window defroster, power windows, an electric clock, a mirror map light, tilt steering wheel, speed alert feature, front lamp monitors, a luggage rack, bumper guards, vinyl tops, sport wheels an electric trunk release, a child safety seat, remote-control outside mirrors, seat and shoulder belts and a sunroof. The 1972 Buick Skylark Custom Convertible weighed in at 1 605 kilos (3,540 pounds) and listed for $3,967 f.o.b. Oshawa, Ontario. 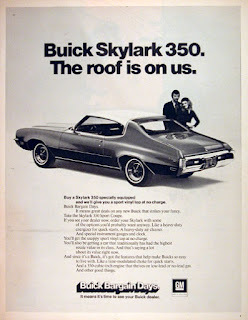 When the dust had settled on the 1972 calendar year, the Skylark had registered 13,448 sales giving it 23rd place, between Mercury Comet and Plymouth Satellite. It would not return for 1973. In its place was the compact Buick Apollo and in the intermediate slot was filled by the Buick Century.